Our class 3B laser is a modern, high-tech form of therapy for sprains, strains, scar tissue, inflammation, arthritis, and stiffness. This method is pain-free and safe. 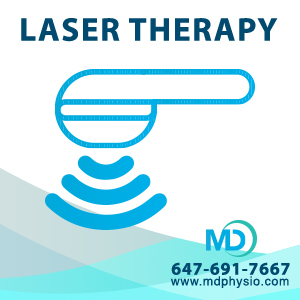 Our laser therapy provides safe and clinically effective treatment for a variety of muscle, nerve, ligament, tendon, cartilage and joint conditions. 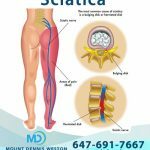 It is an excellent option to treat small and large body parts and works very well to reduce joint pain, swelling, and stiffness. It also helps to reduce the size of scars and can be used to treat scar tissue right after surgery. 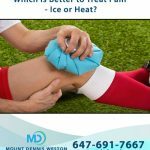 Research has proven that laser therapy is one of the best modern modalities available to help manage sports injuries, pain from arthritis, wound healing, scar healing, and a variety of other medical conditions. Laser therapy works by using focused light energy to promote normal cell structure and function and it heals on a cellular level. The way it works is damaged cells absorb the infrared light energy from the laser, promoting cellular regeneration. While laser therapy is an emerging technology, it is now known globally to be a therapeutic modality of choice for most professional sports teams in the NHL, NBA, NFL, CFL, MLB and MLS. Laser is an ideal tool to use for both acute and chronic issues and can be used with virtually no side effects. The laser that we use at our clinic is able to produce up to 1040 mW of power output which allows us to treat even the most stubborn and persistent conditions. 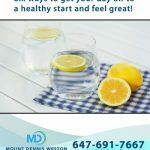 Our laser therapy at Mount Dennis Weston Physiotherapy and Chiropractic Centre is completely pain free.